This is the place to stay for New Years Eve. The view is amazing! You will not find a better place to watch the fireworks. It is absolutely fair priced. It has the best employees and volunteers, they keep the place super clean and fun all the time. 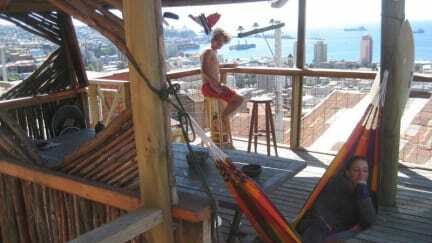 I extended my stay to a full week, the hammocks are just a great chilling spot in a crazy city like Valpo. The owner Kent has his own beer, which is delicious and free to take your whole stay. Marie & Tito for president! Hope to come here again!